The paintings of Tosar Granados. 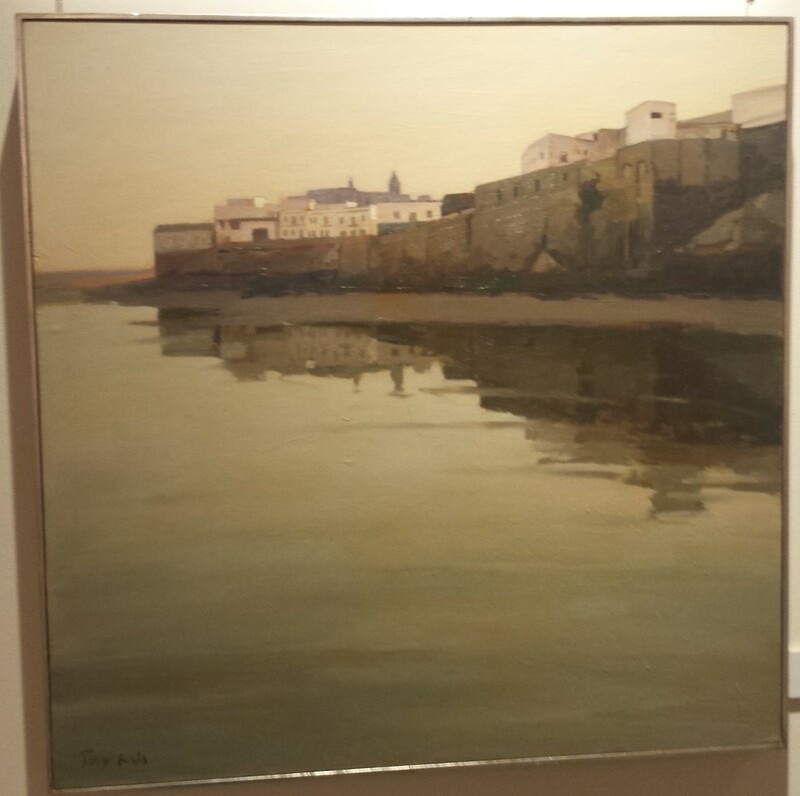 While in Jerez recently I happened upon an exhibition of paintings by Manolo Tosar Granados. Not a painter I had ever come across before, I was glad that I saw his show. 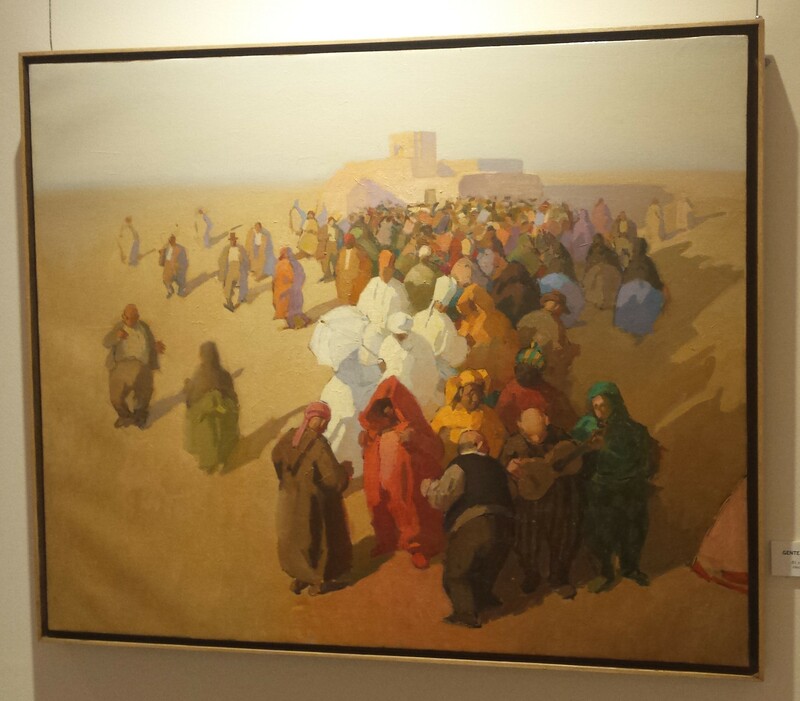 Granados is still painting in his native Spain, although many of these works were from the nineteen nineties. The exhibition focuses on two main themes in his paintings – first, his studies of light as it falls on the angled planes of the ‘white villages’ of Andalucia, or an idealized version thereof, and second, figures in a desert landscape. 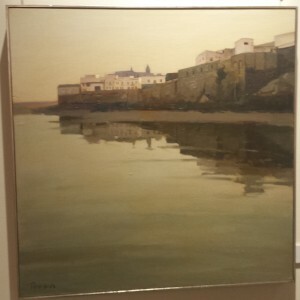 But, in addition to these large canvases and smaller canvases which support the larger works, there is also a group of naturalistic portraits and figures and some pictures of coastal towns like Rota. The image to the left is one such. The pueblos blancos pictures portray a number of different hill-top villages, each containing the same or similar elements – the out-line of a distant church, white plastered houses, flat and pan-tiled roofs, narrow, winding alleyways. 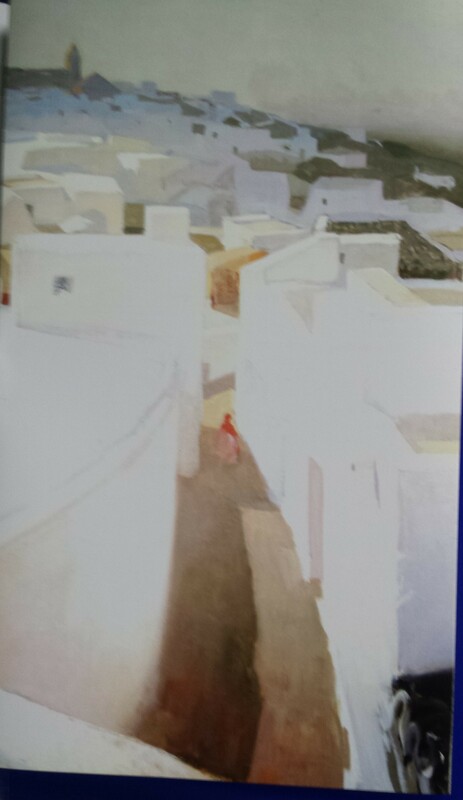 These are juxtaposed differently in different paintings and catch the light in different ways. Often there is a figure of a woman walking along an alley, only just within our field of vision, about to disappear around a bend or corner. The light is always white bright. These are beautiful and I covet one. The photographs within this article come nowhere near doing them justice. The desert pictures are much more colourful. 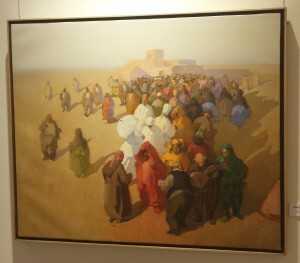 They invariably show a group or tribe of gaily dressed people, some walking towards the viewer, some away, in a flat desert landscape. Sometimes there is a building, a church or caravanserai, but there is always a musician, a lutenist or guitarist. One shows the group in a wide flame-lit courtyard dancing and singing at night, with the title ‘Goyaesques’ and the figures are not unlike late Goya figures, though not so dark as the Black Paintings, they have something of that grotesque quality about them and are similar to figures in Goya’s Caprichos. Then there are the portraits, three heads, including self-portrait, which are very good indeed. There is also a mesmerizing large canvas of an aged woman feeding pigeons on a sea wall and a pair of nudes. I will gloss over the somewhat twee picture of children sea-bathing ( although it attracted much popular interest when I was there ). I will certainly watch out for Tosar Granados in future. The exhibition is in the Sala De Profundis exhibition hall within the Cloisters of Santo Domingo, Alameda Christina, Jerez de la Frontera and runs from 7th October until 15th November 2015. Opening hours are 10.00 until 14.00 and 17.00 until 20.00 Tuesdays to Fridays and 10.00 until 14.00 on Saturdays ad Sundays. Admittance free. This entry was posted in Art, Culture Vulture, From a Foreign Field and tagged Foreign field, Worth a visit by juliej. Bookmark the permalink.